My house is most certainly a reading house. On a typical morning the kids will drink their smoothies while perusing the closest book pile and my husband is always reading something new. Since the first of the year he's made it through Wuthering Heights, Pride and Prejudice, Jane Eyre and currently working on The Count of Monte Cristo (and yes I do realize he's one of a kind!). We like our books so getting a chance to use and review StoryTime Treasures from Memoria Press was a promising opportunity for us. Memoria Press is a family-run publishing company that produces educational materials that align with a classical education, which emphasizes language, mathematics and the cultural Christian West through works of history and literature. 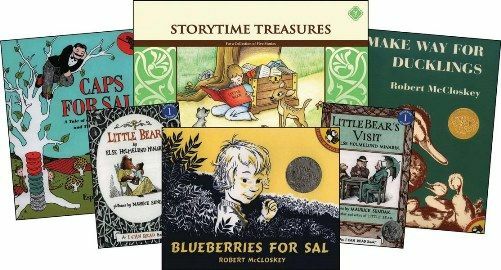 For this review, we received the StoryTime Treasures Student Study Guide and StoryTime & More StoryTime Treasures Answer Key (one answer key for both collections), which is considered to be 1st grade curriculum. It was very generous of Memoria to include the Study Guide for 5 stories when we might only have time to look at 2, if that. The activities in this study guide use real books (as opposed to books created for reading instruction) to teach and reinforce all kinds of language skills like vocabulary, punctuation, comprehension, and composition. In college, I ended up studying the beginning of the 20th century in 3 different classes all in one semester. From then on I have LOVED learning concepts from in the midst of real and varied venues. This study guide pulls from each story important learning concepts on top of highlighting really great children's literature. It's a rich combo! During our review time, we were able to look at 2 stories out of the 5 available, Little Bear's Visit and Caps For Sale, and their corresponding activities. 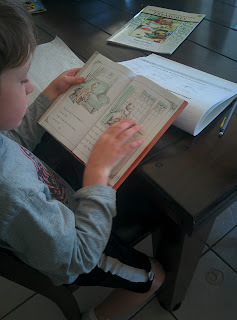 Each book's activities were divided up into lessons that provided plenty of work for my young first grader. In these two units of lessons alone, we were introduced to verbs, characters, setting, and verb tense as well as vocabulary, reading comprehension and even some math in Caps for Sale! While there is valuable content surrounding each book, in this collection there is no required order so jumping around - at least in this set - would not hurt one bit. We started with Little Bear's Visit and tried to work on a half a lesson to a whole lesson per day a few times a week. There is quite a bit of writing involved and my son did tire of that pretty quickly (though he is young and activity driven so it wasn't surprising). If we didn't get to everything some days we would finish it up during our nap or nighttime story time. Toward the end sometimes I would skip the actual writing of the answers (because it took the longest and resisted the most by my son) and work on the understanding of things orally. Cutting down or eliminating the handwriting portion would definitely make this collection suitable for engaged kindergarten level students. For each book, which included 3 or 4 lessons in the Study Guide, there was Comprehension Questions, Fill-in-the-blanks, Language Lessons (introduction to grammar terms), and Just for Fun sections that involved things like drawing or simple math. The Answer Key includes a half page on each lesson of all 12 stories in StoryTime Treasures and More StoryTime treasures with corresponding answers for every question or activity. I didn't use the Answer Key very much because of my familiarity with language concepts, but it helped to make sure we weren't missing something intended. When ordering this curriculum you are given the option to buy the literature along with the Study Guide. They are great books to have in your own library, but it isn't required to purchase them, which is nice because all of them are available at our local library. On most pages there is a downloadable sample page to view a portion of the actual text before committing to a purchase. As a literature lover in college, this curriculum reminded me of all the classes in college where we discussed books continually! It provides so many opportunities to discuss matters beyond just an answer on the page. I loved it! 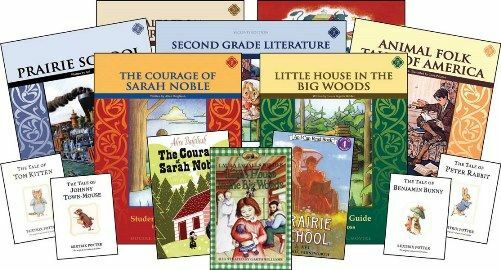 If your student(s) are older, Memoria has a great assortment of curriculum for every grade level that continues and enhances this dynamic with all kinds of literature. As teachers and learners, we are all in need of differing things so in the younger grade levels if you are looking for work that is predominantly independent, this might not be what you are looking for. We're still trying to reach reading fluency with my son so this really did take our story time to a new level! Thankfully, our reading house didn't mind one bit!